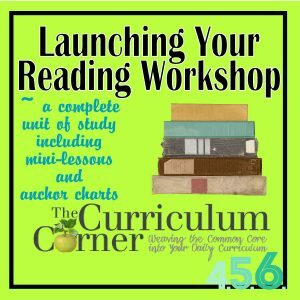 This complete unit of study will help you with launching reading workshop in your intermediate classroom effectively. The key to a successful readers’ workshop is teaching your students the right procedures so that the workshop runs smoothly and effectively. Use these launching lessons to create a more organized and meaningful experience for you and your students. Since many of these lessons build the foundation of your workshop and are more managerial in their intent, many don’t address a common core standard. WARM UP – Most true reading workshops begin with a 10 to 15 minute mini-lesson. However, in intermediate grades some teachers may choose to start with a 5 to 10 minute “warm up” during the transition between subjects (or as students enter the room, if your school has students switching teachers for subjects or if you are departmentalized). Some ideas we like include responding to a prompt in a reading journal (for some to share during the mini-lesson or reading “rap” up/sharing) and responding to a prompt on a graffiti wall. We’ve created graffiti wall signs to accompany our launching unit. You will find these here: Graffiti Signs for Launching Reader’s Workshop. MINI-LESSON – Some teachers prefer to read the book (or section/chapter of a book) for the mini-lesson during a read aloud time earlier in the day or even the day before. This allows the students to enjoy the story before being asked to focus on a specific concept or purpose. It also helps the teacher keep the mini-lesson within the 15 minute suggested time frame because only the portion of the story that is needed for the lesson can be reread. INDEPENDENT READING – Following the mini-lesson, students move to self-selected or independent reading. During this time students should be given a task to complete in order to help them stay focused and to allow them to practice a new skill. As students read independently and respond to their reading in very specific ways, the teacher conferences with individual students. If you do not yet have a system set up for conferencing, we have a few ideas and forms here: Independent Reading Conference Forms. READING “RAP” UP – At the conclusion of independent reading, the class returns to the meeting spot to review the lesson and discuss what students did to practice a new skill on their own. ***Your conferencing these first few weeks should be focused on getting to know your students’ strengths and weaknesses as readers. 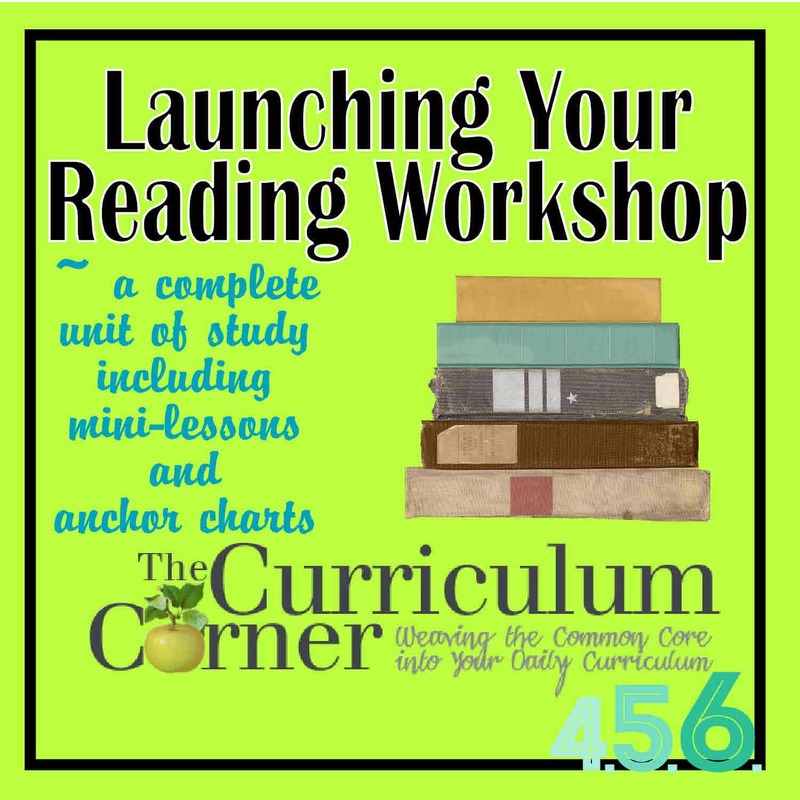 You should be determining reading levels (DRAs, running records), assigning interest inventories, and taking notes for strategic reading groups. Protecting the Silent Reading Time – During this first lesson you will lead your class in a discussion about why reading silently is so important. Help them to realize that silently reading for longer periods of time builds reading stamina and increases their reading and thinking skills. To begin this lesson, show your class a few clips from YouTube of famous musicians in rehearsals for some of their more well known songs. Ask the students to give reasons why musicians rehearse their songs and performances over and over. Help lead them to the conclusion that musicians practice so that they can perfect their music. Readers need the same thing….the more practice they get, the better they become. Introduce the anchor chart (link below) and discuss each guideline. At this point have your students spend a few minutes choosing a book (or they can read one they have brought from home) and move straight into silent reading. There will be no independent tasks to accomplish during this time, other than to simply read silently. As students read, you will begin your conferencing by choosing three to five students to talk with. You may choose to begin assessing your students levels or you may want your first conference with each student to be more of a “getting to know you” as a reader. After at least thirty minutes, gather the students together to discuss some of the book choices they made and review the anchor chart one last time. At this point you may want to use an idea of Laura Robb’s that we particularly like. Teach your students how to respond to a cue to lower the noise. Perhaps together, the class could create what that cue might look or sound like, so that they understand what it means and know how to respond. Ways to Choose Books – Because the texts for intermediate students can become lengthy, we want to make sure they choose books carefully and make good decisions when they are perusing the classroom library for independent reading titles. We don’t want them to invest a lot of time getting “into” books only to realize they aren’t interested in them and then abandoning them. One way to help them with this is to lead a discussion about the choices they make before they begin reading a book. (This isn’t to say that good readers don’t sometimes abandon books they don’t find interesting, but this lesson is to guide them so this doesn’t happen too often.) We have created an anchor chart with some ideas for students to think about when choosing books. More independent reading and conferencing will follow this discussion. Rockin’ the Right Books – To prepare for this lesson, you may want to have your students bring in some of their favorite music (and you may need to stress the idea of APPROPRIATE music!). If you don’t have students do this, then prepare by gathering some different types of music to play for the class – heavy metal, classical, pop, rap, country, hip hop, 50s, and 80’s would be a good sampling of various music. As you play each type of music for the class have them respond to how they feel about the music, perhaps by raising their hands if they like it, dislike it, listen to it often or would never listen to it. Lead a discussion about how, much the same as people have different tastes in music, we respond to reading in a very similar way. We all base what we choose to listen to and read on our tastes, thoughts, opinions and backgrounds. The difference with reading, however, is that in addition to our these things, we also need to keep in mind that some books may be too difficult for us to understand at this point, some may not challenge our thinking at all and then there are those that are completely appropriate for our current reading lives. Share and discuss the following anchor charts before displaying them in your classroom. **If you’d like to personalize your display a little more and connect it with the lesson presented, you might want to use the matching chalkboard frame and add pictures of some of your students. Above the “Rockin’ the Right Books” anchor chart, you could place a picture of one of your students holding an iPod, wearing ear buds and having fun while dancing. Above the “Rockin’ the Wrong Books (Too Hard)” anchor chart, you could place a picture of one of your students with a pained look on his/her face holding hands over his/her ears with a CD player placed next to them – as if the music isn’t to their liking. Above the “Rockin’ the Wrong Books (Too Easy)” anchor chart you could place a picture of one of your students next to a CD player as he/she is laying with their head down on their hands, as if sleeping. These would just be fun visual reminders of the lesson on choosing books at the appropriate level. “Rapping” About Your Reading – Ask students if they’ve ever heard of a “rap session” and what they think it means. (Dictionary.com defines a rap session as – a usually informal or unstructured group discussion, attended especially by people with shared interests, concerns, or problems.) After some discussion about this, tell your students that (in addition to their silent reading) thinking and talking – or “rapping” – about their reading is just as important. In order to gather differing opinions and thoughts to stretch our thinking, focused in depth discussions about the texts we are encountering need to occur. Lead a discussion about what types of conversations your students think they may have about the books they are reading. Let them know that sometimes you will give them very specific and focused conversations you want them to have, but other times you may simply tell them to conduct a “rap session” about their reading. The following anchor chart can be presented about these less formal conversations. Participating in Student-Led Discussions – To further illustrate the concept of a rap session and to show your expectations of future literature circles or group literacy projects, you may choose to follow up the last mini-lesson with some modeling. In your classroom, create a “fishbowl experience” with a group of students where you are acting as a student leader. (If you are not familiar with a “fishbowl experience”, picture you and your group of students in the center of a circle as the rest of your class gathers around this “fishbowl” to watch what is happening.) Your modeling will include beginning the discussion with some open-ended questions about the texts students are reading. Perhaps ask for some quick summaries and initial thoughts on these texts. You may also choose to bring up the subjects of connections – text-to-self connections, text-to-text connections or text-to-world connections. Keep questions as open-ended as possible so that discussions flow more freely. Also model how to keep these conversations focused so they don’t stray from discussions about reading. Finish this lesson by wrapping up the discussion in an organized way, then share the anchor chart (link below). Abandoning Books – It is important for students to understand that sometimes, readers abandon books. It is also important for students to understand that when abandoning books, they should have a good reason. To demonstrate this idea, read aloud the beginning of a chapter book that does not immediately grab your attention. As you read, share your thoughts such as I am not yet pulled into the book or this is not making me want to keep reading. It is also important to emphasize that while there can be good reasons to abandon a book, it should not become a habit. Distinguishing Between Fiction and Nonfiction – This lesson is designed to be a review since most of your students will already know the difference between fiction and nonfiction. Begin by giving groups of students stacks of ten to 12 books. Have them work together to place them into fiction and nonfiction piles. When all groups have finished, create a t-chart poster to write the characteristics of each of these two genres. Have students use the books at their tables to explain and illustrate the ideas you will write on the chart. (Some things you might wish to make sure are included are listed below.) When the t-chart is complete, pass out book order forms and have students cut out pictures of book covers to glue on to corresponding sides of the t-chart you created to further illustrate the difference between fiction and non-fiction. If you feel your students are more advanced, you may wish to have them break down these two genres even further. (Fiction – science fiction, fantasy, traditional literature, realistic fiction, historical fiction, mysteries; Nonfiction – biographies, autobiographies, informational). Books We’ve Read Chart This is designed to be a place that you and your class can keep track of the fiction and nonfiction books you read together at the beginning of the year. If you would like to continue the idea of keeping track of books read in each category during the launching unit, have your students complete their own, individual chart. Keeping a Record of Your Reading – Explain to your students that we all gravitate mostly towards the books that suit our tastes. Have some students share some of their favorite genres and why they enjoy those genres. Tell them that although this is perfectly fine, we need to make sure we vary the types of books we read so that our thoughts and ideas are broadened and even challenged. We can’t ALWAYS read mysteries or concentrate ONLY on nonfiction because then we won’t come to an appreciation and understanding of the importance of other types of literature. To help students keep track of the types of books they are reading, and then to take it a step further – to monitor themselves to make sure they are reading across genres – introduce one or all of the reading logs below. Be sure to tell the students that this is something they will keep with their other reading materials and it is something you will check periodically during a conference so that discussions about book choice can occur. Solving Unknown Words – For this unit, we suggest using the book Mufaro’s Beautiful Daughter by John Steptoe. This is a book that has a variety of words which might be new to students. As you read the story aloud, encourage students to use context clues to determine the meaning of unknown words. Once students have made their predictions, discuss how they might work to confirm the definitions. Help students create a list that includes resources such as asking a classmate, using a dictionary and looking on the computer. We like to create a chart that includes a column for the word, a column for the prediction of the word and then a column where students can record the dictionary definition. Using Punctuation to Understand Author’s Meaning – Before this lesson, cover up the punctuation in the book Yo! Yes? by Chris Raschka with Post-It notes. Gather the class and attempt to read this book without the punctuation. It will be difficult and not make much sense. Discuss how even the smallest amount of punctuation can contribute so much to what an author is meaning to express in a text. Remove the Post-It notes and read the book again, putting extra emphasis on the punctuation and meaning as you read. Oh my goodness! I love this post! I teach middle schoolers, and I have been looking for ideas to implement the workshop-style in my classroom. Thank you! Thank you! We are working hard to add more content over the summer. Keep checking back – launching writing workshop is our next project. Wow! You have great stuff on here! Thank you! Is there a way to get the parking lot sign to upload? There were a few things that wouldn’t upload. Thanks Lauren! These should be fixed now!